Injuries associated with high-powered, candy-colored magnets — with entertaining names like Buckyballs, Buckycubes, Nanospheres, Neocubes, Neoballs, Nanodots or Zen Magnets — have prompted the Consumer Product Safety Commission to propose new rules to develop safer federal standards. This means parents can have a voice in getting these unsafe products off the market by commenting on the CPSC’s website. We encourage you to comment. The CPSC warns of the dangers of super magnets. To comment on the proposed rule, click here. Comments must be submitted to the CPSC by Monday, November 19, 2012. It’s simple to do — just click the above link, fill in your basic information then type your comment. Explain why you think these dangerous toys should be removed from the market. 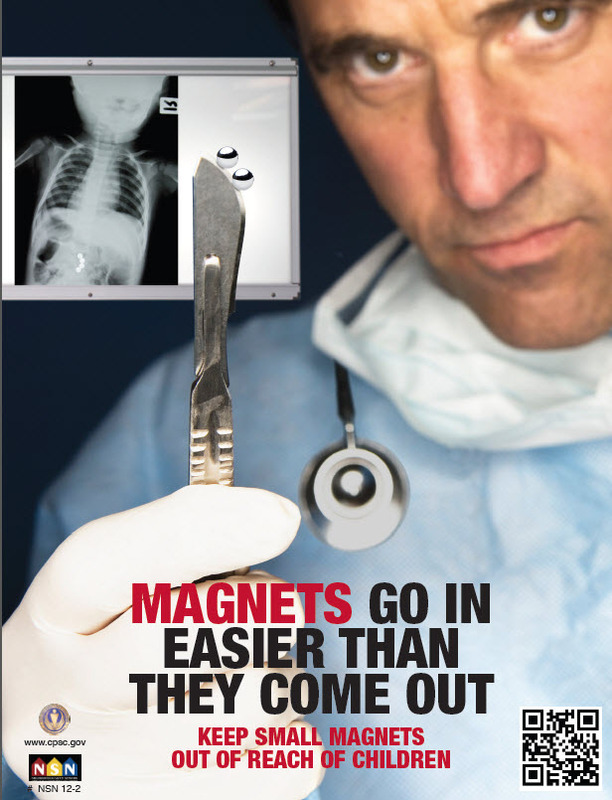 The CPSC estimates that super magnets were associated with 1,700 emergency room-treated injuries between 2009 and 2011. Seventy percent of those injuries have been to children between 4 and 12 years old. The CPSC is proposing a rule that addresses the strength and size of magnets. Under the proposed rule, magnets that fit in a small parts tester would be required to have a flux index of 50 or less. Many high-powered magnets in the sets sold are much stronger. Magnet sets that do not meet the new requirements could not be sold as a desk toy. Many of these super magnet sets are marketed as stress relievers, puzzles and desk sculptures and labeled not for use by children; however, children have been harmed by these. When swallowed, magnets link together inside a child’s intestines, then clamp onto body tissues. This can cause intestinal blockage, perforations, sepsis and even death. Internal damage from magnets can cause serious, lifelong health problems. If your child has been injured due to swallowing super magnets, contact the super magnet injury attorneys at Carr & Carr. We help families across the United States from our Oklahoma offices in Tulsa and Oklahoma City. An experienced lawyer can help you determine what your next steps should be. Remember, there are important time limits within which you must file a lawsuit to protect any rights you might have. These time limits are called “statute of limitations.” To preserve your rights, you must file a law suit against each person or company whom you might make a claim against before the time limits expire. Any person who is sued after these time deadlines will be able to have the claims against them dismissed.